As a millennial, I have grown up surrounded by technology, but I also remember what the world was like before smartphones, tablets and computers. I am part of a generation that has watched an incredible technological evolution take place in a short amount of time, which means I am always looking for ways to push technological limits further. 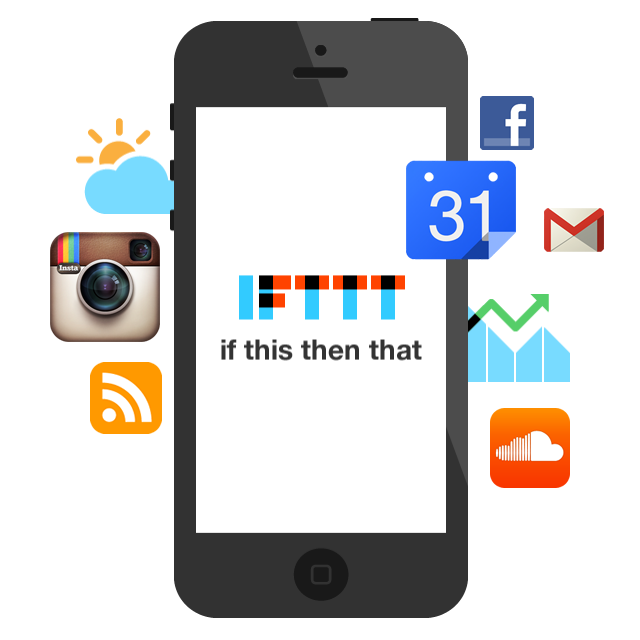 If This Then That, or IFTTT, allows us to do just that. IFTTT is a tool created to make your technology communicate better by using customised ‘recipes’. It allows for further cross-platform communication that the standard ‘share this tweet on Facebook’ or ‘share this Instagram to Facebook/Tumblr/Twitter’ options. IFTTT incorporates 101 different ‘channels’ with more added every day. A channel can be anything from a social networking platform to SMS – Facebook, Twitter, LinkedIn, iOS photos, Delicious, Diigo, Dropbox and Phillips Hue are all popular examples. You set up ‘triggers’ and “actions’ for your ‘channels’ of choice, only your imagination will limit the opportunities here. A typical trigger can be “When I Favorite a Tweet” with the action “Add a row to Google Spreadsheet”. Further, IFTTT allows you to customise the ‘ingredients’ in your ‘recipe’ so you decide exactly how the action is carried out. IFTTT makes your life easier by automating tasks you would otherwise spend time doing manually or perhaps not done at all. Do you ever Favourite Tweets thinking you’ll come back to them? Or perhaps you cycle to work, but often forget to check the weather? Ever gone on holiday and forgot the name of that amazing restaurant you visited? These are just some of the problems IFTTT can help manage. Favourite interesting Twitter content and save it in a Google Spreadsheet. Keep all interesting content from Twitter in one place by using the Favourite button. Weather update to SMS. Get the weather update by text before you leave your house in the morning, you’ll never have to work in wet clothes again. Save Foursquare check-ins in Google Calendar. Easily follow your own movements from Google drive, ideal for the frequent traveller. Diigo to Google Spreadsheet. I recently worked on a project that included a mapping of online resources. The mapping was to be done by social bookmarking, but the findings had to be published in a report as well as made accessible in Diigo. This recipe meant I could do all the work using Diigo and IFTTT recipe customisation for effective categorisation in Google Spreadsheet. Log work hours in Google Calendar. IFTTT will fill in your timesheets for you, great for office management. This does require your workplace to have 3G or WiFi. Create an IOS reminder when you star a Gmail. Got an important email you need to get back to? Just star it and have your phone remind you later. These are just a few examples of how you can become a multitasking superhero using IFTTT, why not TRY IT? This blog was written by Ingvild Storm Stiland. Currently finishing her journalism degree at Falmouth University, Ingvild has been freelancing for CommsConsult Ltd. over the past four months. She is passionate about the powers of social media and its role in social activism.